Shree Shyam Dealcom is a leading manufacturer and supplier of bio coal and biomass briquettes in West Bengal. We cater to the country’s growing needs for a form of bio-energy created using biomass as the raw material. This product is the perfect alternative to conventional coal, charcoal, lignite, and firewood, the resources of which are very limited. It is also effective for the production of electricity from steam, the heating of industrial boilers, and even cooking. Our product also lowers the emission of carbon dioxide in power plants. Because, it is totally made of green waste, it is the most eco-friendly option for such tasks. At Shree Shyam Dealcom, we are the bio coal briquettes manufacturer in West Bengal and create these blocks and briquettes using compressed organic matter like rice and coffee husk, municipal solid waste, jute sticks, wood chips, tobacco waste, wheat straw, seed cases, fibrous leftover of sugarcane after extraction of the juice (bagasse), and other substances containing high amounts of nitrogen. 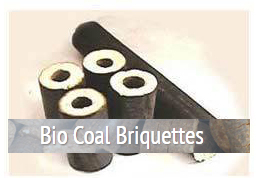 What Are The Advantages Of Bio Coal And Biomass Briquettes? These are environmentally safe energy sources which are very much renewable in nature. They have low sulphur content, cause zero pollution, and are affordable. Their process of creation does not stress the environment much as they are nothing but a conversion of agricultural and organic waste. The process does not need the addition of any chemicals and thus, the product remains natural. Compared to the loose form of bio coal and biomass, these briquettes have a higher specific density, bulk density, practical thermal value, and boiler efficiency, and are easy to transport and store. The best part is, they are cheaper than most conventional energy sources. No fly ash is formed while burning these briquettes and thus, they are an ideal choice for complete combustion requirements. Which Industries Is This Product Applicable To? ANY INDUSTRY THAT USES BOILER PLANTS. 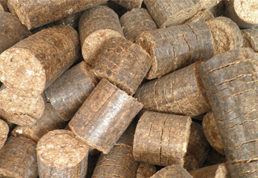 What Makes Us The Best Biomass Briquettes Manufacturer in West Bengal? At Shree Shyam Dealcom, we believe in contributing to a greener Earth by setting our best foot forward toward lowering pollution. As a trustful biomass briquettes manufacturer in West Bengal, this is our sincere effort to meet the rising demands for better and safer energy resources which are not exhausted. Our aim is to cater to those masses, who are suffering the battering of a high rise in the price of fossil fuel. We present to you quality products that have been manufactured using the best practices and standard of the industry. Research and development is an integral part of our work approach and our team of diligent professionals is our USP. Strengthened in both the aspects, we hold a strong track record of providing timely services to our clientele and keeping their satisfaction before everything else in our priority list. Need more information on our products and services? Feel free to give us a call at +91 9836002640 / +91 9831116656 / +91 9331808640 or drop us a line at info@shreeshyamdeal.com. We look forward to speaking with you.